We are currently offering a rider special for Marion Riders — ALL 2019 MARION registrants will have the opportunity to register early, before general registration opens, for the 2020 Mt Mitchell ride. Registration for Marion is currently open. Please click here to register today and secure your spot to register early for Mt. Mitchell in 2020. Please note that The Assault on Mt Mitchell is SOLD OUT for 2019. 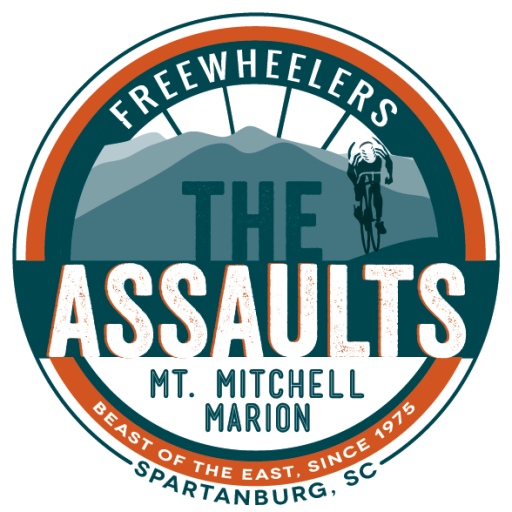 The Assault on Marion is a 74.2-mile self-paced ride starting from Spartanburg Memorial Auditorium in downtown Spartanburg, South Carolina and ending at Tom Johnson Rally Park Pavilion at 373 Resistoflex Rd., Marion, NC 28752. The Assault on Marion began in 1994 to allow more cyclists to participate with those riding to Mt. Mitchell. Although it does not include the 28-mile trek to the top of the mountain, this event is as enjoyable and engaging as any around with its rolling hills, multiple climbs, and compelling North Carolina scenery. It is a wonderful challenge for any cyclist, regardless of their skill and experience. The Assault on Marion presented by Prisma Health will be held on Monday, May 20, 2019. For more Safety and Training information click here. Packet pick-up will take place on Sunday, May 19, 2019, from 1:00 PM – 8:00 PM at the Spartanburg Memorial Auditorium. You will be able to drop off a small dry clothes bag during Packet pick-up that will be transported to Mt. Mitchell. On the morning of the ride we will offer packet pick up from 5:30 a.m. to 6:15 p.m. Cyclists can also drop a dry clothes bag off at that time until about 6:15 a.m. when the trucks are locked up. Ride Start will be Monday, May 20, 2019, at the Spartanburg Memorial Auditorium, 385 North Church Street at 6:30 a.m., sharp! Route: An interactive cue sheet is available on Ride with GPS. Parking: Parking is available in the Spartanburg Memorial Auditorium lot. Rest Stops: Riders along the route are supported with 10 rest stops that offer food, beverage, first aid kits and toilets. Please reference the Cue Sheet for specific locations. SAG & Tech Support: SAG and Tech volunteers are available along the route to provide assistance for riders. Not all volunteers have experience with bike repair but will work to get you assistance. Vehicles typically carry a cell phone, tubes, air and minor first aid kits. There will be bike techs along the route, but they may not be stationed where you break down and are not guaranteed to have the exact items you may need. If you need special chains, tubes etc. be sure to carry them with you. Cell phone service may be sporadic in areas. Please come prepared. Post Ride: Upon finishing, riders will have access to food and beverage and changing stations. Buses will transport riders off the Mountain to the Tom Johnson Campground to enjoy post-ride festivities and further final destination transport options. Refunds: We cannot offer refunds or credit a registration fee towards next year’s event, no exceptions. However, it is possible for registrants to transfer a number to someone else, see below. There will be absolutely no refunds or transfers on accouterment items such as bus tickets or extra meal tickets. Transfer policy: Transfers are allowed until Thursday, May 16, 2019. The registered rider sells their spot directly to the new rider. Once completed contact Katie Jordan, director@theassaults.com with details. A $30 transfer fee is charged to the new rider as they get registered. Online registration closes FRIDAY, MAY 17 at 5 p.m. In-person registration is available at packet pick up on Sunday, May 20 from 1 p.m. to 8 p.m.
Bikes can be loaded into your personal car or family member’s car who is picking you up when you finish the ride in Marion. Option 2 ($30): Monday regular bus – After enjoying lunch, you will board a bus to the Spartanburg Memorial Auditorium. Your bike will be put on a separate truck and transported to the auditorium. No exceptions. Purchase bus ticket during registration, then you will pay a $5 parking fee directly to Tom Johnson Campground and park in a designated area when you arrive on Sunday, May 19. Parking closes at 6 p.m.! *Important to note: No refunds will be issued for any bus tickets. Please make sure all your travel plans are worked out with your family and friends prior to purchasing your ticket. You may purchase bus tickets any time during or after you register. ** Please note that this is a long day with many moving parts. Please plan with a little wiggle room. Registration for The Assault on Marion is Open!